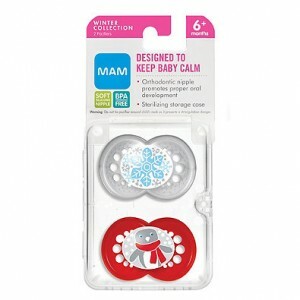 MAM Holiday Pacifier 2-Pack Giveaway! Do you have a newborn, infant, or little one at home this season? Tuck these adorable Holiday Pacifiers from MAM into their stocking as a cute gift idea! 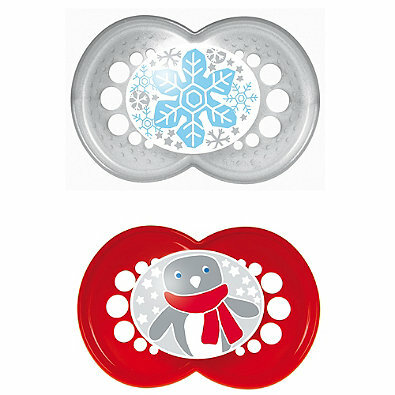 Designed for comfort and featuring festive winter designs, these holiday pacifiers are just too cute! For an affordable $7.49 for a 2-pack, the BPA-free pacifiers make a fun & practical gift for the tiniest member of your household! Win it! Two lucky winners on Tiny Green Mom will win the MAM Holiday Pacifier 2-pack – just in time for gift-giving this season! From November 26th – December 10th, you can enter to win daily on Tiny Green Mom! First, leave a comment below to let us know why you would love to win the MAM Holiday Pacifier 2-Pack Giveaway! Visit MAM on Facebook. Please leave a comment below to let us know you have stopped by their page to learn something new! This is only valid for one entry. Follow MAM on Twitter. Leave a comment with your Twitter name to let us know that this has been done. This is only valid for one entry. The MAM Holiday Pacifier 2-Pack Giveaway ends on December 10th, 2016 and is open to the US only. Please leave your email address in each comment, and make sure to leave a separate comment for every each and every entry that you make so that they will count for you! http://tinygreenmom.com/wp-content/uploads/2016/11/MAM-Holiday-Pacis-3.jpg 395 395 Tiny Green Mom http://tinygreenmom.com/wp-content/uploads/2018/07/logo-sm.png Tiny Green Mom2016-11-26 04:54:372016-11-26 10:52:41MAM Holiday Pacifier 2-Pack Giveaway! Is it your little one’s first Thanksgiving? It is for ‘Mom’s‘ baby boy! Since he is not ready for turkey just yet, Happy Family has a wonderful array of Stage 3 Hearty Meals so he can enjoy the feast with us! 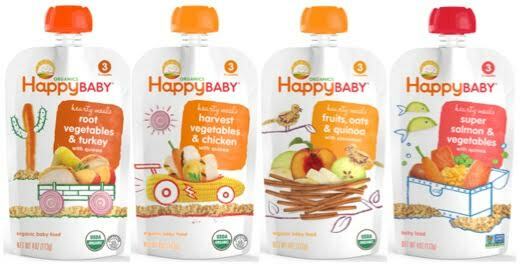 From traditional turkey to chicken and more, there’s something for all growing babies ages 7 months and up to eat! 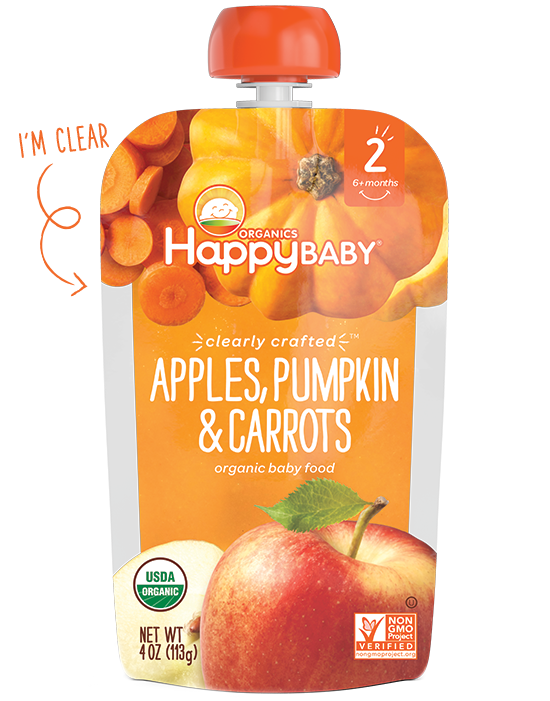 Since cinnamon is a favorite flavor of “Mom’s” little guy, the Hearty Meals Fruits, Oats & Quinoa with Cinnamon is what he gravitates towards, as well as the Clearly Crafted™ Apples, Pumpkin, & Carrots. A lover of root vegetables, like squash, pumpkin, and sweet potatoes, it seems like Thanksgiving and the upcoming holiday season are made for his taste buds! 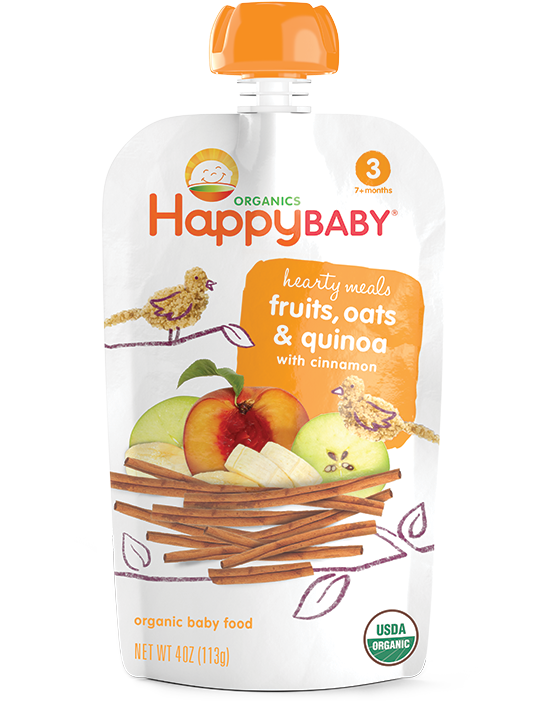 With three children, the Happy Family brand is a go-to brand in “Mom’s” household…and has been for years! 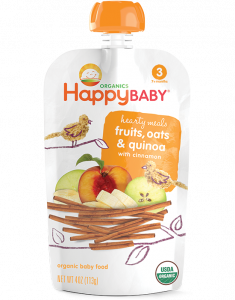 You can always find Superfood Puffs and Organic Yogis tucked in a diaper bag or backpack for snacks when out and about, or the Gentle Teething Wafers on hand when first teeth are coming in! 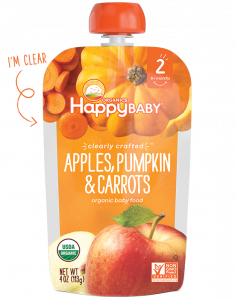 This Thanksgiving, whether you are headed to Grandma’s house or hosting the family at your home, your tiniest tot will love to be included at mealtime, too – thanks to Happy Family! To learn more about Happy Family, check out their website at www.happyfamilybrands.com. 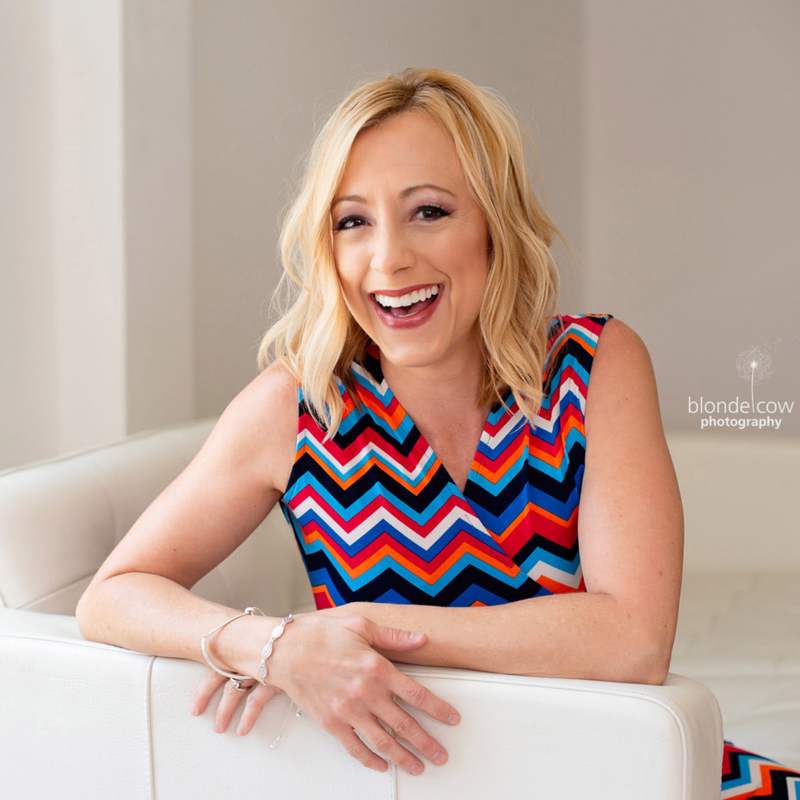 http://tinygreenmom.com/wp-content/uploads/2016/11/HappyBaby-Thanksgiving.jpg 265 521 Tiny Green Mom http://tinygreenmom.com/wp-content/uploads/2018/07/logo-sm.png Tiny Green Mom2016-11-21 21:33:092016-11-21 21:33:09Baby's 1st Thanksgiving! Also known as “Incan Peanuts,” Sacha inchi seeds contain the Earth’s highest source of plant-based omega-3s, have a whopping 8.5 grams of protein and 5 grams of fiber, and are a great source of calcium, iodine, magnesium and iron. 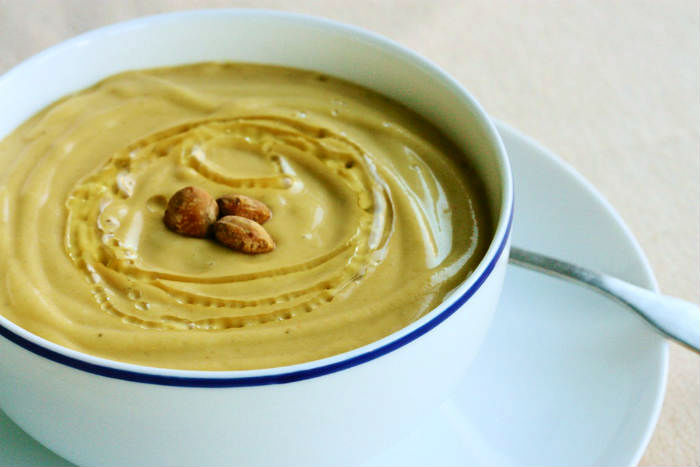 This simple, but deeply nourishing soup from Chef Gena Hamshaw is a delicious recipe that highlights the rich nuttiness and umami flavor of the Sacha Inchi seed, so your family will never know just how nutritious it is! Slice squash in half along the equator and scoop out the seeds with a spoon. Line a baking sheet with aluminum or parchment, and place the squash, skin-side-down, onto the baking sheet. Sprinkle with salt and pepper. Roast for 35-45 minutes, or until the squash is very tender and skin can be pierced with a fork. Roast in oven for 45-50 minutes, or until flesh is tender and skin is starting to turn golden brown. Remove from oven and allow to cool. Once it cools, scoop the flesh out of the skin and set the flesh aside (you can discard the skin). Heat oil in a pan over medium heat. Add the onion and saute until golden and tender (about 10 minutes). Transfer the onion and squash to a blender. Add the broth, nut milk, and Imlak’esh Sacha Inchi Seeds. Blend till very smooth, season to taste with salt and pepper, and blend again. Serve warm, with a drizzle of Imlake’esh Organics Sacha Inchi Oil and extra seeds as garnish! The scents of the season surround you when baking these delightful, cinnamon-dusted apples! 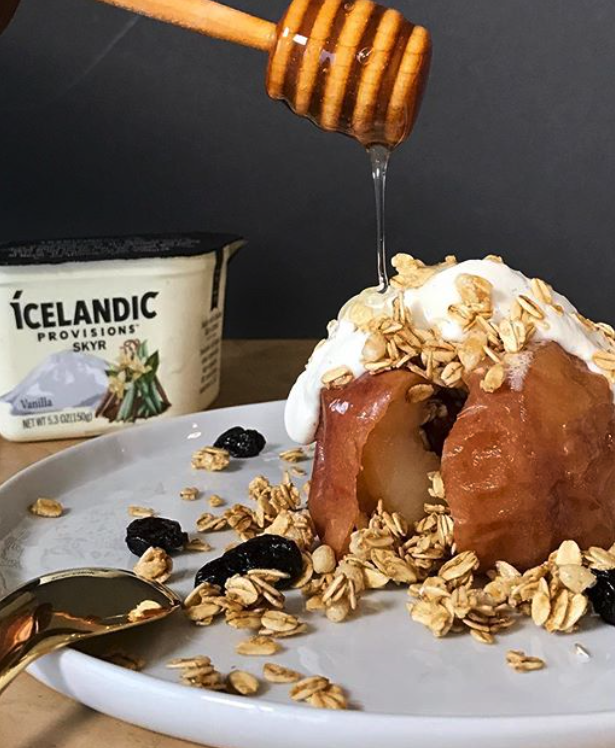 Topped lovingly with Icelandic Provisions Plain Skyr and Apple Cinnamon Granola, this is a sweet treat that is nutritious and healthy! Preheat the oven to 350˚F. Mix together the sugar and cinnamon. Add apples to a baking dish (rub dish with a little olive oil or coconut oil to prevent sticking) and sprinkle with cinnamon and sugar. Bake for about 25 minutes. Let cool slightly, then fill with granola. Top with the Skyr and a drizzle of honey.